Learn how to repair corrupted Alcor Chip Controller .Alcor Recovery Tool For UFD can fix Alcor AU6992,AU6985 and Alcor FC8508 chip controller .Download free firmware software and fix your flash drive . Today we will discuss how can repair corrupted USB flash drive with the following Chip controller "Alcor AU6992,AU6985 and Alcor FC8508 chip controller" .If you have Alcor format errors such as "flash drive isn't recognized by computer ,Write -protected USB flash drive ,Error Message "please insert disk ",Windows can't able to format disk and other format problems . First Download Alcor Recovery Software from the links in the end of this article . Insert corrupted USB flash disk to your PC. Open every recovery software and try it until you fix your flash drive . NOTE this software support only the chip controllers that we mentioned before ,please don't use it with another controllers . 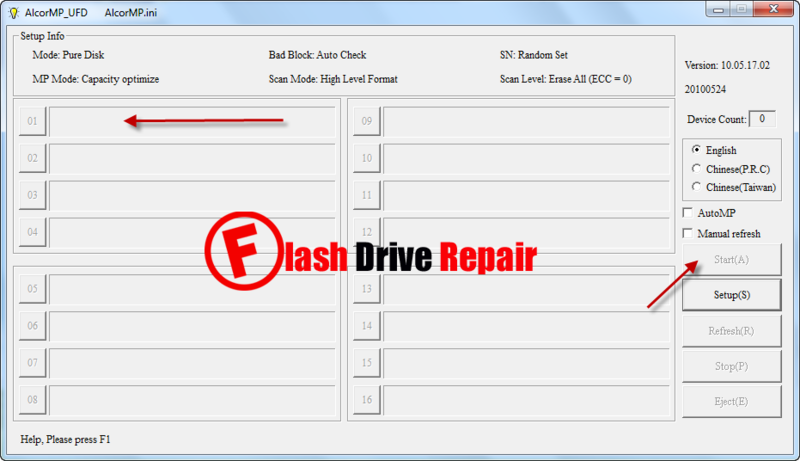 You can use Chip genius report software or USBDeview V2.30 utility to determine flash drive information easily.